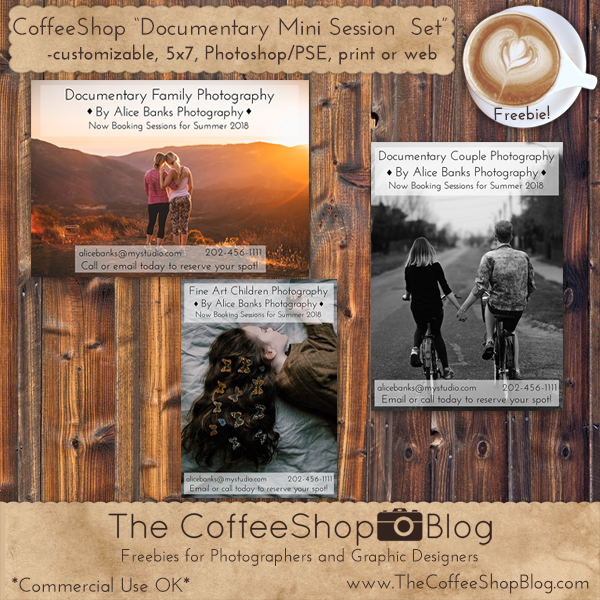 The CoffeeShop Blog: CoffeeShop " Documentary and Fine Art" 5x7 Photographer Mini Session Storyboard Set! CoffeeShop " Documentary and Fine Art" 5x7 Photographer Mini Session Storyboard Set! I have a new action coming out tomorrow and I am working on a new Lightroom preset also!!! I don't know if it is because of the warmer, prettier weather, but I feel so creative right now. I have a huge list of things I need to finish up and post here for download. Today I have a new set of professional 5x7 Mini Session storyboards you can use for print or web. These are "documentary" and "fine art"-themed, but you can change the titles. You can also fully edit everything else on there, including the transparency and size of the white text boxes. I used this font on the boards but you can use any font you wish of course. Original images (sunset, bikes, butterflies). Download the CoffeeShop "Documentary Mini Session Set".